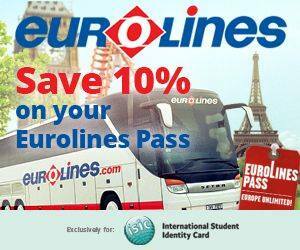 10% off the Eurolines Pass with ISIC and ITIC! Yes, this offer is real! 10% discount off the Eurolines Pass published seasonal prices. Simply enter your ISIC or ITIC card number when booking a 15- or 30-day Eurolines Pass at www.eurolines-pass.eu (available in English, French, German, Spanish, Portuguese), or show your card at a Eurolines Pass shop nearest to you. Not 26 yet? Get your Eurolines Pass at even lower rates! Offer is valid on selected routes within Europe.